(KPL) World Wide Fund for Nature (WWF Laos) has promoted wildlife law enforcement to reduce demand for wildlife products, prevent and combat wildlife trade in the country. 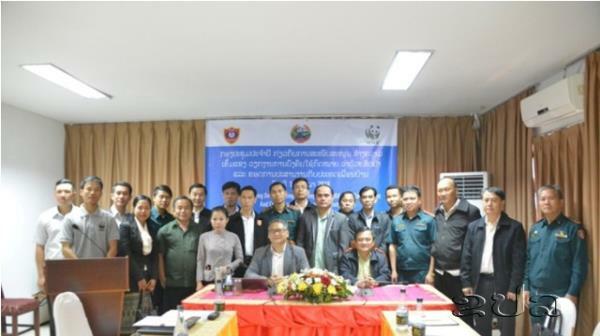 The WWF Laos in cooperation with the Department of Forest Inspection, Ministry of Agriculture and Forestry held an annual meeting on supporting wildlife law enforcement and cross-border cooperation in Vientiane on Feb 14. The meeting aimed to review efforts to promote wildlife law enforcement in Vientiane and Oudomxay over the past six months which were supported with a financial support of US$ 85,000 provided by WWF-Switzerland and WWF-Singapore. “We faced several difficulties regarding the implementation of our activities over the past six months, from April to December 2017, especially on the communication of applicable laws to local communities because most local people rely on forest for food and they lack access to information. Meanwhile we still lack budget and technical officials who can work on wildlife law advocacy,” said Mr. Oudom Seiphaseuth, Deputy Director of the Forest Inspection Department. “I would like to ask all relevant sectors to participate in preventing and combating wildlife trade,” said Mr. Oudom. “This wildlife law enforcement programme aims to promote public awareness of wildlife protection, information exchange, among others,” said Country Director of WWF Laos, Mr Somphone Bouasavanh.